It’s been a while since I’ve written a ‘scorecards in action’ post. Jon Lester’s debut for the Oakland A’s on Saturday against the Kansas City Royals seemed like a good excuse to get a scorecard and some colour pens out and to score along with a game. I used a standard ‘fan’ scoring system (as opposed to the IBAF version, for example), but added in a bit of colour. I used a red pen for outs, blue for hits, walks and normal base advancement, and green for errors. 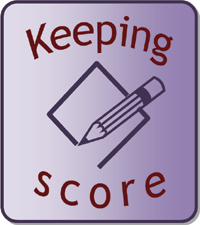 Click here to open a scanned pdf copy of my scorecard. Looking back at the Kansas City side you can see quickly that it wasn’t a completely vintage Jon Lester display, with only one clean three-up, three-down inning in the sixth. However, the Royals’ hits were scattered and were generally only going for a single base. Even the double by Alex Gordon to lead off the fourth inning wasn’t all it may seem, as hinted at by the asterisk I put next to the ‘2B’ designation. Gordon’s double was ‘sun assisted’, as third baseman Josh Donaldson lost a high pop-up in the Oakland sky and he could only cower for cover as the ball dropped harmlessly to the turf. After the next batter, Erik Kratz, grounded out to the second baseman Nick Punto, Gordon moved across to third base thanks to a Lorenzo Cain single that was originally ruled an error on Donaldson, as you can just about see from my hastily scribbled out annotation. It was a sharp play for Donaldson to collect as the groundball fizzed up at him off the infield dirt, but he was behind the ball and for someone of his ability, it was probably a play he would have expected to make. I am stubborn and will hold firm on my own scoring call if I strongly disagree with the official scorer’s decision (adding an annotation to my scorecard just to make clear I’ve diverged from the official stance), yet in this case it was marginal enough for me to go with the flow. Error or not, it almost proved costly for the A’s as Mike Moustakas lofted a flyball into centrefield for what looked like being a regulation sacrifice fly. Sam Fuld – recently reacquired from the Minnesota Twins – had other ideas and let fly with an acrobatic circus throw that gunned the tagging-up Gordon out at home plate to end the inning. As an A’s fan, I was busy celebrating the great play so I didn’t jot down the out straight away and that was fortunate because as the A’s headed to their dugout, the Royals’ manager Ned Yost asked for the play to be reviewed. The new instant replay system is something that score-keeping fans now need to take into consideration, especially if using a pen rather than an easily-rubbed-out pencil mark. If a play looks debatable, now it’s always worth holding fire and making sure if there is going to be a challenge or not before committing anything to paper. In this case, replays showed catcher Derek Norris had tagged Gordon out in time and the play could be scored as it was called initially called by the umpire. I added in a dotted red line just to more clearly link the Moustakas and Gordon outs. Switching across to the A’s lineup side, the coloured pens come into their own by painting a very clear picture on a strange afternoon for the Royals. Jason Vargas, returning from a stint on the Disabled List, overshadowed Lester early on by pitching four perfect innings to start the game. Then the wheels came off in quite spectacular fashion in an extended bottom of the fifth that had me scribbling out the pre-printed inning numbers for the sixth inning onwards. The A’s batted around as they put up eight runs on eight hits. After Norris broke up the no-hitter with a lead-off double, the A’s didn’t necessarily hit Vargas hard but, in the words of the excitable A’s TV commentator Shooty Babitt, they just “kept the train moving” by racking up seven singles. The last single came courtesy of Jonny Gomes – another player reacquired by the A’s on the trade deadline – and it was his second of the inning, but thanks to a Gordon error he ended up standing at third base. This is another example of where the coloured pens help to capture a bit more detail quickly and neatly. The first leg of the diamond is entered in blue with a ‘1B’ alongside, then the line is continued in green – to show advancement on an error – before coming to a stop at third base. Gomes collected two RBI as it was judged that Fuld and Lowrie would have come home on a single, whilst Donaldson’s final leg to home plate on the play was rightly put down to Gordon’s mishap in allowing the ball to skip under his glove in left field and to head to the wall. I probably should have noted Donaldson’s third-to-home line in green rather than blue, but I’ll put that slight slip down to excitement. After Aaron Crow relieved Vargas and ended a long inning, Scott Downs and Bruce Chen came out of the Royals’ bullpen and kept the A’s quiet for the rest of the way, aside from a single in the eighth by Norris. The contrast in the long run of blue for the fifth inning and then the short bursts of red either side show how that one inning completely turned around the entire game. In truth the A’s hitters were not their normal patient selves from the sixth inning onwards as they handed the game over to their pitching staff to complete the victory. The eight-spot put up in the fifth inning had given Lester a seven-run cushion and, although he may have been disappointed to concede two runs in the seventh, it paved the way for a winning debut in the green and gold for the ace for hire.